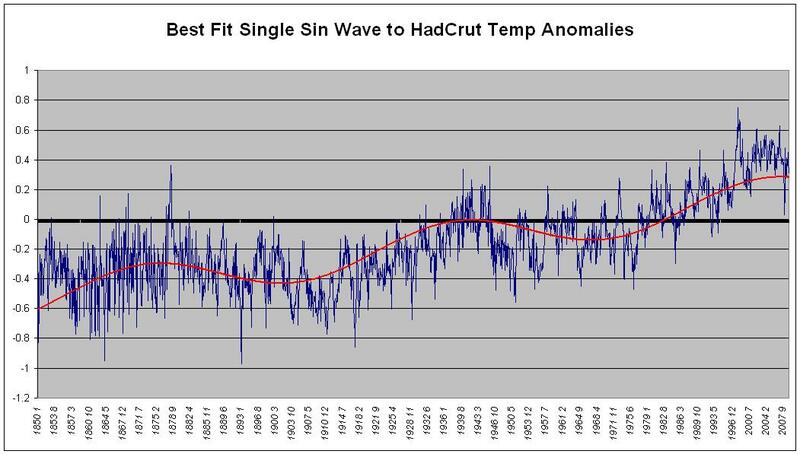 As Monckton demonstrated, if they can make a rising trend from a sine wave they should be sacked and charged with fraud. They created the rise from nowhere and we know it. Air-headed cow! Talk about shooting yourself in the foot! I was sad reading Ms Irvine’s article since I like a lot of her economics reporting. On the unlikely chance she reads this I’ll mention the 160 year sinusoidal trend in HadCRUT temperature data which, if you look at the graph, is responsible for a third of warming in the 20thC. Which is linked to long term cycles in the oceans. Or the 260 years of the Central England Temperature record for which the trend is mostly explained by solar magnetism, presumably via the mechanism proposed by Svensmark. Neither of which are included by the IPCC in their models. I might add that the solar magnetic model fits just about perfectly with Lindzen & Choi 2011’s (low) measurement for CO2 sensitivity. But then I’ve only been a practising scientist for thirty years, what would I know. Bruce, what is ” the third of the GLOBAL warming” for 20 century? Bruce, GLOBAL warming is inside your head; not outside – GLOBAL warming and Santa are not for real. But, put it your way: because of tremendous demand for little fire truck and water pistols by the immature Warmist / Skeptics; to cool the planet – Santa made a big extension to his toy factory -> much more CO2 produced + Rudolf’s methane… the northern polar cap is melting. Bruce, nobody knows the GLOBAL temp for last year; to save his life – how can compare it with temp of 100y ago? But you know even what 1/3 of the difference is…?! Shame, shame!!! They have less than 0,0000000000001% of the data ESSENTIAL, for knowing the correct temperature; before they start monitoring on the other 0,0000000000009% of the troposphere, scientist wouldn’t have believe them. Planet’s temp is not as in human; when under armpit is 1C warmer – the whole body is warmer by that much. In my backyard are 10 variations of temp, that’s just on the ground – who is monitoring up, on the other 29km and 998m of troposphere above? Bruce, I looked with the binoculars up, can’t see you there – if you are monitoring up there – when you get to lower altitude – come for a cup of coffee. 0.27 C out of 0.81 C.
The trough to peak height of the sinusoidal signal is 0.27 C on this sine fit to the HadCRUT dataset. The troughs were in 1900 and in 1970 or so. The peak just after 2000. So of the global temperature rise as described by the HadCRUT dataset of 0.81 C over the course of the 20thC when IPCC modellers train their supercomputers, 0.27 is an illusionary rise solely due to the starting point at 1900 and ending point at 2000. Ditto the satellite era 1970-2000. And half or so of the temperature rise in the 20thC fits the effect of the rise in solar activity as measured by the shortening of the solar cycle length. Previous solar cycle length correlates very well with temperature in the following solar cycle. So found Fris-Christensen & Lassen 1991 and Butler & Johnson 1996, which you’ll find cited in the second link. If 1/3 is due to cycles, 1/2 due to solar dynamo effects that doesn’t leave much for CO2. And that small amount nicely fits Lindzen and Spencer’s satellite measurements. I don’t collect the data for HadCRUT, RSS, GISS, BEST or whatever. But I explain data, ‘s my job. I do chemistry and stats and modelling for a buck. At 2XCO2 of 0.6-0.7 C you’d have trouble frying a gnat. You’re right it could be less that that, given how much UHI and looney GISS adjustments we’ve seen, but hey, if the data says ‘no problem’ why argue whether its gnat or bacteria-grade global frying? Won’t fry us nohow, no matter how hard Prof Flannery huffs and blows. She assumes that skeptics don’t accept that CO2 is a GHG and will cause some warming but that negative feedbacks attenuate the positive feedback loop to higher water vapor concentration. And a host of other factors e.g., changes in the solar wind, clouds, different climate osciallations which influence the distribution of heat around the planet etc. To simply paint skeptics first as basic physics deniers makes the journalist’s task that much easier. The reporter simply engaged a strawman argument. Just mention Hadcrut3 trend since 2001 to any warmists you know …and watch the eyes start to roll around in their heads! Who are these crazed denier hadcrut people that say the earth is cooling? Uhm…That’s Hadley Climate Research Unit Temp…that’s them…those are their OWN FIGURES….it doesn’t get much better than this! She’s a foxy babe, but is sadly brainwashed by the Labour/Green totalitarian regime. I suppose she is only a journalist, after all. I think Jessica should stick to writing about economics. Then again …. She’s just another IDIOT journo … the required OP score for journalism must rank along with teaching; OP for teaching seems to be getting lower and lower each year. cool,followed by cooler afternoon showers and an even cooler ice rainbow event.Later a cool icey beer. The scary thing is not that Jessica is a “good German” who accepts everything she’s being told on climate change, but that she has been encouraged by her editor to do so. I trust the climate scientists who have nothing to gain financially from AGW; they’re convinced AGW may account for a few tenths of a degree of warming and the rest of the scare is blatant empire-building and data torture or doctoring. There simply is no proven causal link between AGW and CO2 concentration in the atmosphere. A loud alarm rings in the ears of every sceptical reporter worthy of the job description “journalist”on the whole AGW issue, but apparently not at the Sydney Morning Herald., which, at every opportunity, does the opposite of what newspapers are supposed to do on such key issues. That sinusoidal chart is most interesting. It’s funny how you always see straight (linear) trend lines fitted to most of the panic merchants’ temperature charts when clearly at a glance there are cycles sticking out like sore thumbs. Now I’m no stats expert, just a mere mortal amateur climate modeller, but if I can see these cycles, how on earth do the expert panickers not see them, or see them and discount them? I guess you don’t get a research grant, nor are you employable at Fairfax, the ABC, Crikey or GetUp! unless you hold to the Warming Apostles’ Creed. Look, the poor woman has to write what she is employed to write. Otherwise she has to find another journalism (sic) job and that would be pretty hard to find for a person who will not follow editorial “direction”. That is just how the media world works. There’s a thing called “self respect” … I grew up in the Third World where people are REALLY poor but despite everything those people had self respect. Journos that write crap because that’s the terms of their employment are prostitutes of the Cause. Actually, Ms. Irvine switches effortlessly from the “correlation” argument as applied to hard physical science to the “No smoke without fire” argument as applied to Economics as a social (soft) science. She ends up comparing apples with oranges – an impressive display of misdirection. Climate scientist also pick point to point time comparisons to show a trend rising temperature. You have one heat wave and bang the planets warming up. You have a super cold freeze and nothing! We need real scientist that are not bias in either parties. But if that happens they’ll find that it has been the Sun all along!! In the same article she’s accusing others of cherry-picking data she fails to mention that during that time ‘climate-gate’, a host of unfulfilled ‘warmist’ predictions and the 100th discrediting of tim flannery may have contributed to rise in the scepticism? Jessica Irvine, obviously understands that any scientist who resorts to cherry picking to promote their preferred hypothesis is not a scientists at all, but an activist. The hapless M/s Irvine has had a number of issued assignments that are seemly well above her pay-grade including property law reporting that counter intuitively argues that a State can sell its minerals to a mining company and then, somehow, these very same minerals still belong to the people. Now it seems that Irvine, again counter intuitively, writes that it is a fact that the sceptics that have to prove the null hypothesis. Earth to Irvine, ALL the CAGW and AGW claims belong to the Warmistas not sceptics and therefore it is the CAGW and AGW claimant’s responsibility to not only provide the evidence for CAGW and AGW, but also prove the null hypothesis. May be they should give Irvine something a little easier to write about.